Most of you already know about the existence of placer gold on certain Pacific Coast beaches here in the U.S., but few small-scale miners have any working knowledge or experience with these sorts of placers. 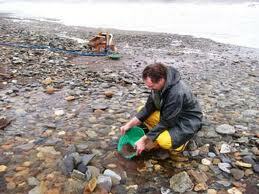 The Discovery Channel's new TV reality series, "Bering Sea Gold," illustrates just how rich these beach placers can be at times, especially the beach gold that lies underwater just offshore in locations like Nome, Alaska. However, the geology of beach placers is not very well understood, which is why I am writing this series of posts (despite the fact I'm not a trained geologist). 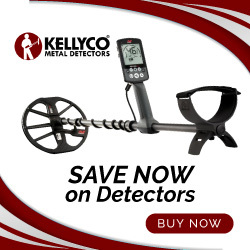 My intent here is to discuss this type of placer gold deposit at length and perhaps bring your overall awareness and level of knowledge up a notch or two. There are essentially two main types of beach placers, ancient and new. What these two categories don't tell you is that "new" in geologic terms may mean millions of years and "old," tens or even hundreds of millions of years in age. In many cases, ancient gold-bearing beach placers are blanketed with "newer" strata or levels that can contain substantial amounts of gold. However, when the ancient layers are exposed or revealed they can prove to be extremely rich by comparison. 1) Glacial advances and retreats. 2) Nearby bench gravels (often along cliff or bluff faces). 3) Gold-bearing veins reduced by erosion, including wave and storm action. 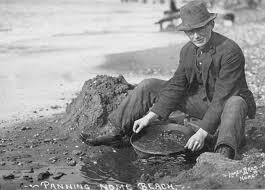 4) Stream-borne placer gold "carried" onto beaches from sources farther inland. In some very rare instances, one or more of these deposition sources can contribute to forming beach placers simultaneously as in the case of Nome, where (at minimum) both glacial and stream-borne dynamics took place. Many heavy minerals are also found with beach gold deposits, including chromite, magnetite, ilmenite, monazite, and zirconium. Heavy black sands like these recovered from beach placers should always be processed carefully because they will inevitably contain extremely fine particles of gold and even platinum in some instances. That's it for now, but there's more to come. So stay tuned. If you liked this post, you may want to read: "Gold Mining Questions and Answers: Part 8"